Intended UseHuman MDC / CCL22 ELISA Kit allows for the in vitro quantitative determination of MDC / CCL22 , concentrations in serum, Plasma , tissue homogenates and Cell culture supernates and Other biological fluids. specificalPrinciple of the Assay: This kit was based on sandwich enzyme-linked immune-sorbent assay technology. Anti- MDC polyclonal antibody was pre-coated onto 96-well plates. And the biotin conjugated anti- MDC polyclonal antibody was used as detection antibodies. The standards, test samples and biotin conjugated detection antibody were added to the wells subsequently, and wash with wash buffer. Avidin-Biotin-Peroxidase Complex was added and unbound conjugates were washed away with wash buffer. TMB substrates were used to visualize HRP enzymatic reaction. TMB was catalyzed by HRP to produce a blue color product that changed into yellow after adding acidic stop solution. The density of yellow is proportional to the MDC amount of sample captured in plate. Read the O.D. 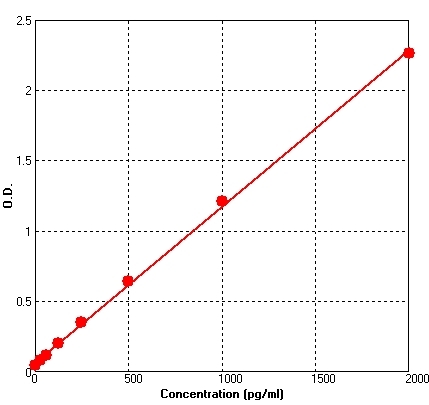 absorbance at 450nm in a microplate reader, and then the concentration of MDC can be calculated. Background: Macrophage-derived chemokine (MDC), also called Chemokine, cc motif, ligand 22 (CCL22) or Small inducible cytokine subfamily A, member 22 (SCY22), is a protein that in humans is encoded by the CCL22 gene. The gene is located in human chromosome 16 in a cluster with other chemokines called CX3CL1 and CCL17. It is secreted by dendritic cells and macrophages, and elicits its effects on its target cells by interacting with cell surface chemokine receptors such as CCR4. HTLV-1-induced CCL22 causes the high frequency of FOXP3-positive cells observed in HTLV-1 infection and that FOXP3-positive cells may both retard the progression of ATLL and HTLV-1-associated inflammatory diseases and contribute to the immune suppression seen in HTLV-1 infection. Inquiry About Human MDC / CCL22 ELISA Kit If you hope to order it or contact us directly, please contact us via sales@biobool.com. We will get back to you in 12hrs,Thanks!